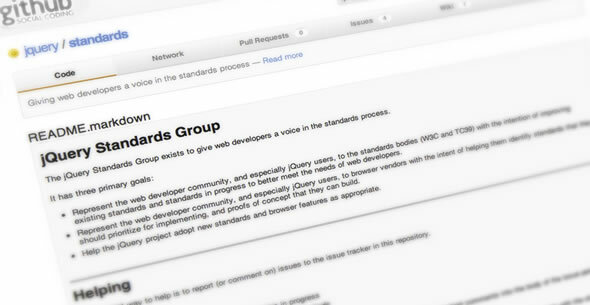 Today we’re happy to announce the creation of a new jQuery sub-team called the jQuery Standards Team to give web developers a voice in the standards process. We all know that web standards are important. They help ensure the code we write works across different technologies, for people of different abilities and most importantly across all browsers. That said, how often do we all feel our voices, suggestions and ideas are heard by those groups responsible for defining these standards? The reality is that whilst many of us would like to see change, due to time restrictions and lengthy formal processes we’re unable to participate in standards discussions, get involved with writing specifications and contribute to meetings about the future of features. This makes it difficult for web developers to have a voice. Yehuda Katz is team lead. Paul Irish joins him. Another problem is that for those that do get involved with the process, it can often feel like participating on a particular thread in standards mailing lists has a limited impact because the web community is so fragmented. Browser vendors are very active on these lists and there’s a tremendous amount of institutional knowledge assumed in almost all threads. Implementors on those lists have their own venues for discussing areas of shared concerns, but web developers wishing to particpate don’t, with the exception of the accidental meetups at conferences. The jQuery project would like to help change this – we want you to have a voice in how the future of the web is shaped. To represent the web developer community, in particular jQuery users, to standards bodies such as the W3C and TC39 with the intention of improving existing standards and standards in progress to better meet the needs of web developers. To represent the web developer community, and especially jQuery users, to browser vendors with the intent of helping them identify standards that they should prioritize for implementing, and proofs of concept that they can build. To help the jQuery project adopt new standards and browser features as appropriate. This marks a large change in the way the web developer community is able to submit feedback and influence both standards bodies and specifications. By lowering the barrier of entry to having suggestions and issues about current implementations heard, we hope to encourage more developers with an interest in dealing with standards bodies and browser vendors an opportunity to participate in the process. The jQuery Standards Team is driven by jQuery team members Yehuda Katz and Paul Irish who some of you may know. Yeuhda and Paul have extenstively worked with standards bodies and browser vendors in a number of capacities over the years, with their individual work on SproutCore and Chrome Developer Relations providing them additional perspectives that will be useful when advocating for the community. You may be wondering why we feel this team deserves to represent the wider web developer community. Because jQuery is used by such a large percentage of sites on the web (over 50% of the top 10,000 sites), we have a good feel for what problems and challenges are commonly faced and what issues with existing implementations we need to try working around. As jQuery is also so focused on DOM-manipulation, the library offers a good source of information for known implementation issues and their (current) best solutions. Although the current team is primarily composed of jQuery team members, we want to get as many developers passionate about standards and specifications involved with the team as possible. At the end of the day, the team’s goal is to to help identify web developers interested in the process and give us all a forum for both discussing the process, ideas and shared areas of concern. We believe that working together, we can all help build a better web. If you’re interested in getting involved with the jQuery Standards Team, the easiest way is to sign up for the Google Group. Similar to other jQuery sub-teams, there are going to be regular public meetings in #jquery-meeting on freenode (date TBA) to discuss how the team can be as effective as possible in promoting the needs of the web developer community. You can also report (or comment) on standard or specification issues in the issue tracker on the official team Github repo. If you’re posting new issues, try to identify problems with specs or standards that either exist or are currently being proposed. Here’s a great example of one such issue. We want to collect well-specified and articulated issues with the web ecosystem and advocate for improvements with the standards bodies or vendors. For genuine issues, we’ll tag them accordingly (eg. W3C, TC39, Browser-vendor etc.) and if applicable, file tickets with the appropriate standards groups or browser vendors so you don’t have to. By creating this new forum we hope to give a voice to the millions of web developers interested in contributing to the process, but without an easy way to do so. Please let us know what your thoughts are about the team as we want to improve it as much as possible. We look forward to hearing your comments, suggestions and ideas about both it and the standards process!